Outspoken and fearless, Deborah has faith in God but struggles to see the potential her own life holds. As an Israelite woman, she'll marry, have a family, and seek to teach her children about Adonai--and those tasks seem to be more than enough to occupy her time. But God has another plan for her. Israel has been under the near constant terror of Canaan's armies for twenty years, and now God has called Deborah to deliver her people from this oppression. Will her family understand? Will her people even believe God's calling on her life? And can the menace of Canaan be stopped? With her trademark impeccable research and her imaginative storytelling, Jill Eileen Smith brings to life the story of Israel's most powerful woman in a novel that is both intriguing and inspiring. 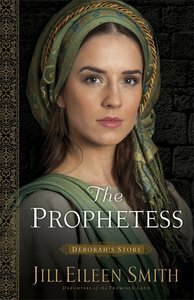 About "The Prophetess - Deborah's Story (#02 in Daughters Of The Promised Land Series)"
Jill Eileen Smith has more than twenty years of writing experience, and her writing has garnered acclaim in several contests. Her research into the lives of David's wives has taken her from the Bible to Israel, and she particularly enjoys learning how women lived in Old Testament times. Jill is the author of the bestselling Michal, and a second volume Abigail, and lives with her family in southeast Michigan. Customer Reviews For "The Prophetess - Deborah's Story (#02 in Daughters Of The Promised Land Series)"
a good story, read within 2 days. However;got bored upon reaching the middle chapters and skipped through Jael's boring tale. Thoroughly enjoyed the war chapters to the end. I absolutely loved getting to know Deborah and her family through this book! I simply couldn't put it down! I felt as if I was transported to that time in the Bible! This novel is exactly what Biblical fiction should be - or any kind of historical fiction for that matter: History brought to life on the page; names given flesh, muscle, bones, and a beating heart; and a story that is completely authentic to its setting. I really cannot recommend this novel highly enough, especially for lovers of Biblical fiction. It is emotionally and historically rich, and hooked me from the first page right up until the last. Deborah is portrayed as having a strong personality, and yet the author never colours her with modern egalitarian notions. Deborah embraces her role as a wife and mother, even struggles against her disappointment at her husband's eternal amiability and willingness to compromise for her sake, and her growth in these roles form as much a part of the story as her roles as a judge and prophetess. Barak and Jael (Heber's wife) are also very well drawn characters, as is the fictional character, Talya. I actually paused in my reading at one point to go back and read the two chapters from Judges because I was sure there must have been details there that I had forgotten about. There were not. I sincerely admire the thought and study that must have gone into not only conceiving such a realistic picture of these characters from the scant details available to us, but then also portraying them to the reader so convincingly. Can one woman's prayers change the world? Hannah and her husband, Elkanah, share a deep and abiding love for each other, for their God, and for His tabernacle at Shiloh. Greatly disturbed by the corruption of the priests, they long for restoration and pray for a deliverer. But nothing changes as the years pass. Years that also reveal Hannah to be barren. Pressured by his family to take another wife, Elkanah marries Peninnah, who quickly begins to bear children. Disgraced and taunted by her husband's new wife, Hannah turns again to prayers that seem doomed to go unanswered. Do her devotion and kindness in the face of Peninnah's cruelty count for nothing? Will God remain silent and indifferent to her pleas?